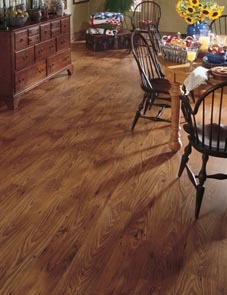 Our team of knowledgeable and experienced professionals is proud to offer beautiful wood flooring for the best prices. We provide various types of wood floors, including quality reclaimed wood floors and distressed wood flooring, as well as engineered, solid, and hand-scraped hardwood. When you come into our store, you will consult with our knowledgeable and friendly associates who assist you every step of the way—from selection to installation. We are committed to being your reliable flooring specialist. We will tell you about each flooring option's different characteristics, whether you need a particular look or type of wood, such as distressed or pecan wood. If you are not sure about the type of floor that is the best option for you, we can help you in any way. Engineered Hardwood Flooring: Consisting of three or more layers, this type of wood flooring resists varying temperatures and can withstand moisture. Solid Hardwood Flooring: This long-lasting flooring has tongue-and-groove milling that provides strength, durability, and can be sanded several times as well. Kahrs™ - Because wood is considered one of the most beautiful, eco-friendly, and versatile flooring materials available, the Kahrs brand sets itself apart from the rest by only working with wood products. This brand’s panels are extremely stable and resist buckling, warping, and cracking, even when the temperature and humidity change throughout the year. The gives you a balanced wood floor that can tolerate dramatic climate changes. Design Distinctions™ - The innovative designers from Design Distinctions have compiled a stunning selection of the sleekest patterns, the most vibrant colors, and the most appealing textures of hardwood flooring for you to browse. When you are seeking to indulge your personal style, you are sure to enjoy the one-of-a-kind product options available in this creative flooring collection. Hand-scraped hardwood floors add Old World charm and appeal to your living room, dining room, foyer, and even your bedrooms. Both hand-scraped and distressed hardwood create an authentic rustic finish that gives the feeling of warmth in your home. Each plank of wood is unique and provides visual interest throughout any space. Hand-scraped hardwood softens your other designs while accentuating the traditional aspects of your interior decor. The quality of your hardwood is not the only factor that plays a role in its longevity. Accurate installation is essential if you want your floors to perform for decades to come. A hurried installation or one performed by anyone other than a professional can mean the difference between quickly deteriorating hardwood and the long lifespan you need. Our contractors take our time on every aspect of the hardwood flooring installation process. While we never rush our work, we still complete every installation in a timely manner. We use the most innovative installation techniques to ensure a phenomenal finish. Contact us today to modernize every room in your home with our selection of sleek hardwood flooring options. We proudly serve the communities of Lubbock, Levelland, Plainview, Seagraves, Littlefield and Tahoka, Texas.